Are You Trapped in a Cycle of Emotional Abuse from Parents? The words of an abuser can cause all kinds of agony and can set one on a lifelong destructive course. 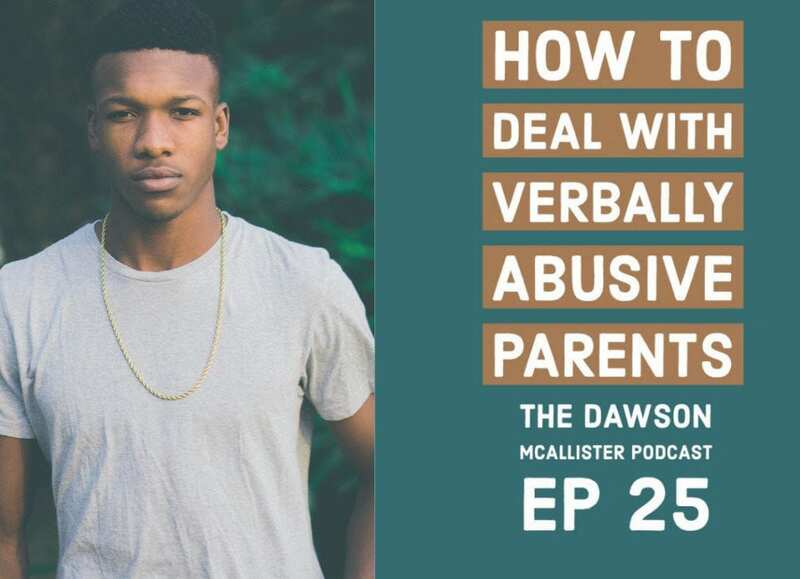 In this episode, I speak with Lance, who’s verbally attacked by his parents. I also talk with Sarah who endures verbal abuse at least twice a day trapped in the car with her dad. And the most difficult conversation I had is with Tameka, whose father emotionally and verbally abuses her. He calls her names and puts her down every day. If you need help dealing with verbal abuse in your family, then this one is for you! Lance’s parents get angry at him for stupid reasons. They call him names and he says, “It’s getting stupid.” Lance gets so stressed by his parent’s abuse, he forgets his responsibilities and messes up even more. Like Lance, most victims of verbal abuse feel put down, afraid, hurt, angry, confused, and helpless to do anything about the situation. In this case, Lance tried to get away from the abuse by hiding in his room, trying to avoid the conflict. The words of an abuser cause all kinds of agony. It can set one on a lifelong destructive course. The Bible does not mince words when talking about a destructive tongue. It says, “The tongue is a fire. It is full of wrong. It poisons the whole body. The tongue sets our whole lives on fire with a fire that comes from hell.” James 3:6 In spite of this graphic description, the verbal abuser seldom understands or cares about the havoc he or she is causing. Most are full of rage and have no idea the damage being done. Lance is afraid of his parents. They use vicious words to control and hurt him. Lance is stressed at what his parents are doing which causes him to forget what they are trying to say. It’s a vicious cycle. They verbally abuse him, he stresses out and forgets what they require of him, so they abuse him more. Then he forgets again, they get angrier and lash out. Lance doesn’t have an advocate or someone to help him with his problems. His abusive parents have beaten him down and he doesn’t know what to do but just knowing someone cares will help him tremendously with his tragic situation. Sarah is in a very difficult situation. She and her sister are in the car, with their father for 10 minutes, twice a day, to and from school. Their father is extremely angry. He’s full of rage because of the divorce and who knows what else. Attacking the girls verbally is irrational but in some ways it must make him feel better, even though he’s doing great harm to his victims. When Sarah becomes gentle and humble with her words, she can help soften her father’s harsh and angry words by not letting him get her upset. After a while, the father will run out of things to say. He will see love and wisdom demonstrated during their drives to and from school. God’s love is powerful. It can do some amazing things, even turn Sarah’s father into a changed man. Tameka’s father has been emotionally and verbally abusing her for 6 years. He calls her names and puts her down every day. Tameka feels she can’t take it anymore and is starting to break down. Tameka is stuck and needs help to find a much better situation. She needs to get away from her abusive father. The Bible tells us about King Saul, who was David’s mentor but also his authority figure. Saul had the right to put David to death and anyone else under his dominion. Saul fell away from God and was determined to kill David because he was jealous and hateful towards him. Tameka, like David, is under the authority of her father. Before attempting to leave her horribly abusive situation, she needs to hook up with safe people who will protect her. She definitely needs our prayers for strength and courage as she reaches out to others. Let us all pray, God will change Tameka’s father, so he will turn from his vicious ways. The Bible says, “A worthless man digs up evil, and his speech is like a scorching fire.” Proverbs 16:27 May God stop him in his tracks, may he turn to Christ to forgive him and find a whole new life of love and support. Did Today’s Episode on Abuse Get You Thinking? Check out my eBooks: Understanding Hope, and Understanding Forgiveness, and Understanding Self-Worth. Check out my blogs: Hope for the Abused, What is Verbal/Emotional Abuse?, and What is Abuse? Check out this story of hope: I Hated My Life…Your Show Saved me! Need to talk about verbal abuse in your life? Sign up for an Email Mentor, an online coach who will email you and come along beside you to offer support. Join me for my next episode on depression. In this episode, I speak with Samantha who finds herself emotionally exhausted. I also get a chance to talk with Melissa, facing a serious setback after her counselor is murdered. Then, I realize that Cody has a core belief, he’s worthless. Lastly, Dustin shares how even though he’s got some debilitating health issues, he’s reaching out to people who are depressed and encouraging them. From this episode, I hope you gain encouragement and are able to get help by learning from other’s experiences.